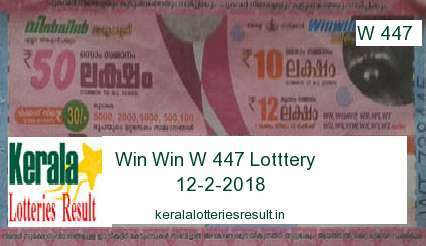 12-2-2018 Win Win Lottery Result W 447 of Kerala lottery draw held on 12.2.2018. The lottery result of Win Win Lottery W 447 will be published online at 4.00 pm today. Kerala lottery Win Win w447 is a weekly lottery run by Kerala lotteries every Monday. The Win Win Lottery Monday result, Win Win Lottery Result Today, Kerala lottery Live result today will be available after 4.00 pm in this web site. The Kerala lottery 12/2/2018 Win Win W 447 ticket holders can check their lottery result here. Kerala lottery Win Win is a weekly lottery. The cost of lottery ticket is Rs 30/-. The Lottery draw will be held on every Monday. After 3.00PM the lottery result will be published by Kerala lotteries department. Kerala Lottery Win Win Live result will be available on www.keralalotteriesresult.in web site. Kerala lottery Win Win Winning numbers, Win Win lottery winners, Win Win lottery prize winners and winning numbers can check here.